I do not really know what to say, except that there is clearly more work to be done in bringing different communities into contact with each other, whether archaeologists in Bulgaria and historians in Austria, or people who are interested in material culture in an abstract way, and people who are interested in reconstructing it. And while non-archaeologists can be frustrated that archaeologists have not yet published the things which we want to learn more about, there are often other things to read while we wait if we just learn how to find them. 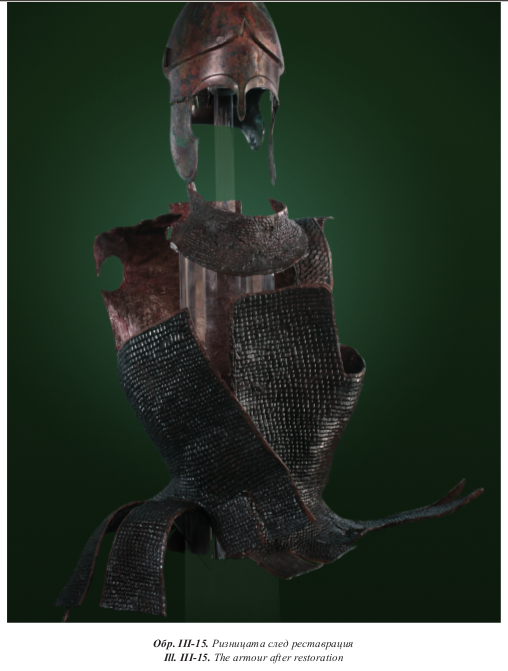 Fabregat, the reviewer, also reminds readers that some art from the so-called Celtic regions of Iberia, southern France, and northern Italy seems to show a version of this style of armour worn by warriors who are otherwise dressed like locals. A catalogue of this iconography is available in an article by Fabrice de Backer * and is still useful even though I have some concerns about his general statements about armour. The sheepskin arming cap inside the helmet has survived mostly intact, and Agre describes it in detail including the dyes which once coloured it (p. 90). Photo from Daniela Agre, “The Tumulus of Golyamata Mogila near the villages of Malomirovo and Zlatinitsa” (Sofia: Avalon Publishing, 2011) p. 84. I also think that this find reminds us that even if we are mainly interested in one culture, sometimes evidence from their neighbours can help us understand them better. While this armour is not shaped exactly the same way as armour in Athenian vase paintings, equipment in Crete or the Greek cities in Italy was not exactly the same as Athenian fashions either. 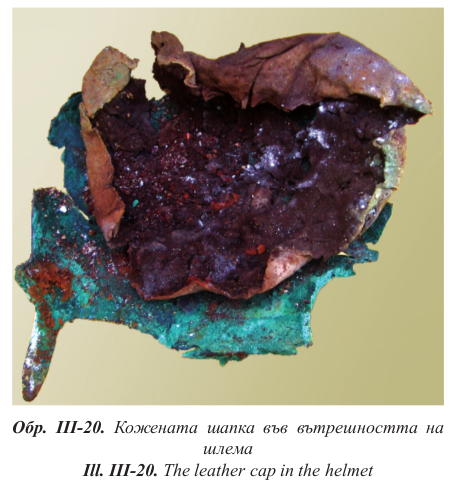 Edit 2016-03-03: On the tube-and-yoke armour of solid iron plates from Agios Athanasios Tomb III in Thessalonike, Raimon Graelis i Fabregat recommends Μ. Tsimpidas-Avloniti, “Άγιος Αθανάσιος, Μακεδονικός τάφος ΙΙΙ: Ο οπλισμός του ευγενούς νεκρού,” in ΝΑΜΑΤΑ: Τιμητικός Τόμος για τον Καθηγητή Δ. Παντερμαλή [Thessaloniki 2011] pp. 351–63 which is also available as a free PDF in Modern Greek. Superb set of artifacts I know only from photos. Really helpful, armour which proves Xenophon passage is very useful for me! Thanks a lot. I get trough both articles, but my intuition and sense for practicaity tells me, that there has been surely under armour some form of linen vest or quilted material, it is too thin to absorb pressure from strikes. Glad to help … and to “boost the signal” of good research from outside the US and western Europe! I briefly have read the whole book, I certainly this week will be reading all chapters again, the most fascinating finds, I couldn’t even imagine. 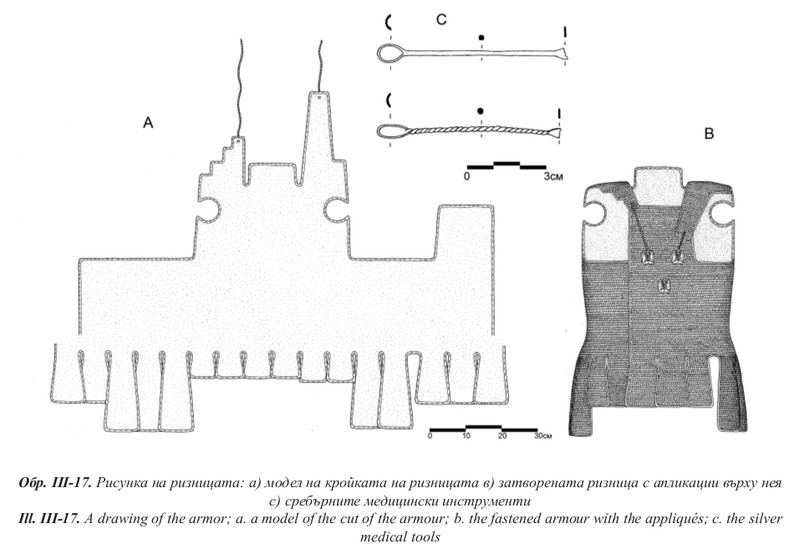 Not just arms, armour, but also medical tools, 2 horses, dog etc. Did you read it whole book? Thank You again, what a luck, that author Daniela Arge made her book bilingual and available. In my opinion (but I don’t have acces to the most recent typology and artefacts) helmet and armour fits more into late 5th CE BC than earl 4th CE BC. And one pearl for an end “our experts” at Charles Prague University (UK) and elsewhere had research in Bulgaria recently ( https://en.wikipedia.org/wiki/Pistiros ) and long term (sometimes from 1950s onward) but, we don’t have this book at UK or national library, or elsewhere, not to mention other new books about Thrace! Internet saviour of us all (at least sometimes)! There are certainly many interesting artifacts in there! But because it is too far away from my main research, I only had time to skim it. My old post on glued linen got a lot of hits recently, so I was glad to be able to post something positive which is not just arguing about the same few lines of literature or how to interpret paintings.